The Sound of Music was the final collaboration between Rodgers and Hammerstein and became the world's most beloved musical. When a postulant proves too high-spirited for the religious life, she is dispatched to serve as governess for the seven children of a widowed naval Captain. Her growing rapport with the youngsters and generosity of spirit gradually captures the heart of the stern Captain, and they marry. A stalwart of Community Theatre, Glenda Kenyon is thrilled to be directing both her talented daughter Lauren Eade, who plays Maria, her husband Greg Kenyon, who plays Baron Elberfeld, and Lauren’s niece Finlay, who plays one of the Gretels! We sat down with Glenda and Lauren for a chat about performing with your family and why this production will be so special. When did you start in Musical Theatre? I performed in my first show with Rockdale Musical Society at the age of 8, and have been part of the community ever since. Lauren: My siblings and I have been around theatre all of our lives, going to rehearsals/performances with Mum & Dad for as long as we can remember. We virtually grew up in various theatres around Sydney and the Illawarra, and learned so much by watching the talented people around us. Glenda: My mother Edith Paull has always been my inspiration, my teacher and mentor. She directed with an intention to help actors find the truth and sincerity in their characters. She taught them the stage craft that helped them express and communicate effectively and thoughtfully. She would spend hours of her personal time coaching actors with dialogue, body language and nuance. Her love of theatre, and dedication has always been at the heart of my own performing life. Lauren: My greatest theatre inspiration is my brilliant mother, who has an amazing eye for details, who will give you honest feedback to push you to be better, and has a wealth of knowledge and experience to draw from. She is a “thinking actress” and every thought, and every idea passes across her face to help the audience understand the characters that she plays, more than most are able to portray. Mum can demonstrate how to say a line, so that it can be interpreted in ways that you may never have thought of. She is my “go-to” for every performance that I’ve ever done, and I know that she has made me better in EVERY role that I’ve ever done. Why did you want to do The Sound of Music? Glenda: As I have played Maria three times myself, it seems the most natural choice of show for my first time as Director. It holds many fond memories of different companies, directors (my own mother being one of them), and cast mates. Wonderful friends and memories have come from this musical. This was an opportunity to be part of all of that again, with some old treasured friends, and lots of new ones too. Lauren: I wanted to be part of mum’s directorial debut, because I knew that she would be brilliant, and so easy to work with. It’s so great that Finlay Thomas (my niece) and Greg Kenyon (my dad) are part of this too - it really does make for a wonderful family experience. Finlay has come to many productions during her young life, so I feel particularly blessed to be part of her first show. Musical Theatre has always been a family affair, with my grandparents being so crucial to the beginnings of Community Theatre in Bankstown and Rockdale areas. Mum and Dad met while doing theatre at Bankstown, my extremely talented brother Daniel Kenyon, has performed here, and it seems like coming back to Bankstown has just been a full circle for the whole crew. My Mum has played Maria 3 times (!! ), so I can’t think of anyone more qualified to direct this show, or anyone’s footsteps I’d prefer to be following. We are all incredibly proud of the generations that came before us, and all of their creative achievements. Have you ever worked together before? Glenda: Lauren & I first performed in The Boyfriend together with Lauren’s twin sister, Lesley as the lead, and my youngest son Jordan on the spot. Greg, Lauren and I have done Secret Garden, Lesley, Greg & I did Les Misérables and Man of La Mancha together too. More recently, Lauren and I performed in Little Women together, where I played her mother, Marmee, and she played Jo. I’ve played opposite my husband in countless roles, and at the beginning of my theatre career, with my mum, Edith Paull, my dad, Bill Wilkes and my brother, Warrick. For me, theatre has always been a family affair. Lauren: As well as the shows mum has mentioned, I’ve also been part of a couple of shows with brother Dan - Aida, Company, Wicked, and just recently, to critical acclaim in Jekyll & Hyde for Arcadians, where we had standing ovations for almost every performance. Glenda: It’s very easy, as we all have the same mindset and commitment to achieve the best performance possible. Lauren: I always find it easy to work with the family, because we all have a pretty solid view of the work and energy that goes into each show, we are all very committed, and have a strong work ethic, and all want to be part of the best show that we can. There is also an understanding between us that we can be honest with each other, and trust each others critique of our own performances - which only makes us achieve greater things. We also have had a similar amount of exposure to theatre and musicals, and we can all expect a certain level of performance on a consistent basis. I believe we all come into it, trusting that each of the others is acting on an intention to make every single performance as good as it can be, and to tell an honest story to the audience - who deserve nothing less than our best. Are there any challenges in working together? Lauren: Sometimes it can be difficult to turn “off” the focus of our current project, as it manages to come up in every conversation, and every family get together. I’m sure we drive other people mental! Are there any roles on your bucket list? Glenda: Perhaps a play… Private Lives might be nice to do again. Lauren: I’d love to do Mrs Lovett in Sweeney Todd and also the Witch in Into the Woods. I always thought that I would play Nancy in Oliver! one day, but the timing has never been right. The shows I like to do are the ones where I can appreciate the music - and although I haven’t heard of it being staged here, I’d love to do Jane Eyre The Musical - it has stunning music. What is your directorial vision for this show? Glenda: To ensure this timeless story is told in an authentic way - with faith in the writing and the abilities of the cast in this production. 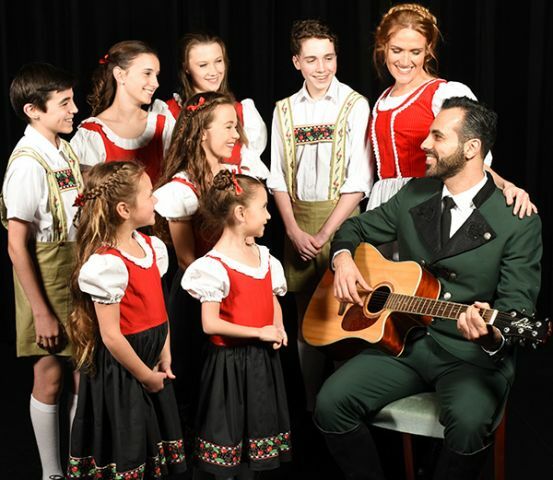 The Sound of Music is a show that audiences are fond of in its classic form, and the cast have auditioned to be part of the worldwide Sound of Music family, lucky enough to have been in this musical. Glenda: It’s important to support all of our local community theatre groups - they’re the first school for budding actors to learn and grow, and also a great creative outlet for other part time actors. With so much technological distraction at our fingertips, it’s a great way to meet people, develop new skills and utilize the ones we were born with. So many of our professional performers had their start in Community Theatre - without an audience, this wouldn’t exist. Lauren: There is a stack of work that goes into creating a good production, and the performance is simply the culmination of all that work- lighting, costumes, scene changes, and on stage cast- it’s always great to see new creations from passionate people… this one is no exception.